Buck, a sturdy crossbreed canine (half St. Bernard, half Shepard), is a dog born to luxury and raised in a sheltered Californian home. But then he is kidnapped and sold to be a sled dog in the harsh and frozen Yukon Territory. Passed from master to master, Buck embarks on an extraordinary journey, proving his unbreakable spirit. 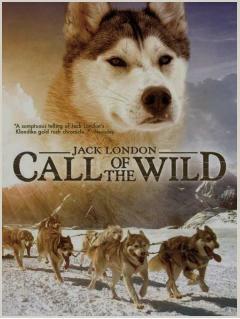 First published in 1903, “The Call of the Wild” is regarded as Jack London’s masterpiece. Based on London’s experiences as a gold prospector in the Canadian wilderness and his ideas about nature and the struggle for existence, “The Call of the Wild” is a tale about unbreakable spirit and the fight for survival in the frozen Alaskan Klondike. I read this book as part of the Banned Book Week, hosted by Sheila @ Book Journey. I had planned on reading a different book, but I messed up and ended up only having a little over a day to read a book and write a review, so after searching for a shorter banned book, I decided on this one. I’m so glad I did!! I love anything to do with Alaska and/or sled dogs, and even knowing I’d probably love the book, it was far better than I expected. The book starts out giving info on Buck’s life and how he ends up and Alaska. From there, it quickly gets sad and then gets sadder. There are many things that happened in the book that made me cringe, but the author drew the story from his time as a gold prospector, and it’s an important part of the story. I enjoyed reading about Buck, and fell in love with this dog that endured so much and never lost the wonderful spirit that he was born with. London doesn’t use a lot of unnecessary words or descriptions, and that added to the loveability of the book for me. I could see everything so clearly in my mind and was sad when it ended. I don’t remember having to read this in school, but I wish it had been one of the assigned reading choices, and think it should be in every school. I loved this book so much that after I finished it, I got the audio version for my iPod, and plan on listening to it while I walk on my treadmill. I’ve had this book on my tbr list forever and regret not getting to it sooner. I would recommend this book to everyone who hasn’t read it, and for those who did years ago, re-read it! It’s a 5 star!! Why was the book banned? That was one of my dad’s favorite books. I’m glad to see it has stood the test of time. Huh! I don’t really understand the thought process behind the banning of some of these books. I read it and it was a perfectly lovely read. I never realized that The Call of the Wild had stirred up so much controversy! I read it and loved it as a child. Thanks for sharing. I never read this one as a child and I am not sure that it would be my kind of book even today, although in my effort to try and read more international stories, discovering more about the Californian mining industry and the struggle for survival in those unforgiving times, would be interesting. I wonder if, having read the story and obviously enjoying it so much, you think that ‘Call Of The Wild’ would still be on the YA banned list today, or if it has now ‘done its time’ and should be free to be made part of the school reading list? Given the hard hitting and almost abusive literature which purports to be suitable as YA fiction today, the changing times becomes so much more noticeable. Nice review and I am pleased that you finally got to read and enjoy this one. My daughter read this a couple of years ago and told me she loved it, but that I shouldn’t read it. She knows the types of books that will make me cry. I vividly remember my teacher reading this to the class in 5th grade. The impact of the writing was astonishing and 20+ years later I still remember scenes from the book. Thanks for reminding me of this one! I’m not sure I can read it again but I do remember sitting silently listening. I remember reading this when I was younger. I can’t believe it’s a banned book. This was banned? I suppose I shouldn’t be surprised; so many books I wouldn’t imagine being banned have been. This is one of my childhood favorites! I read this book many times as a young reader, it was one of my favorites. Vicki, I read this many years ago, when I was in school. I feel that I should reread it, sooner rather than later. Excellent review! I read this one a few years before I started blogging and I loved it too. I followed it up with London’s White Fang and was just as happy with it.